2 FREE BEACH CHAIRS INCLUDED WITH RENTAL! With the most popular floor plan on the beach, you can enjoy magnificent views of the world’s most beautiful beaches from every bedroom. 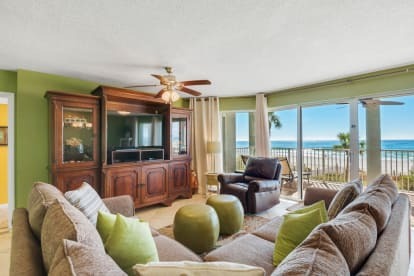 The sugar white sand beaches and the shimmering emerald waters of the Gulf of Mexico are also showcased through the spectacular floor to ceiling windows of this open floor plan from the living room, dining room and the kitchen. This spacious condo is almost 1800 square feet and is located on the 2nd floor allowing easy access via the elevator or the stairs. This desirable end unit overlooks both the gulf and one of the 3 beautiful Polynesian pools of this fantastic resort. 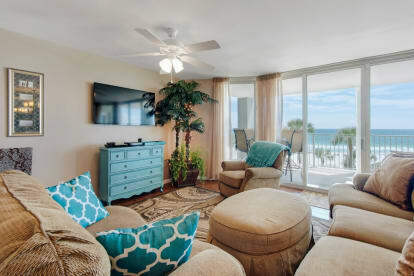 Two bedrooms open to the main covered balcony…a great place to watch the sun set over the water. The 3rd bedroom/suite features its own private gulf front balcony. This unit has been upgraded for 2013 with new living room and bedroom furniture, including mattresses and bedding. Watch your favorite TV shows and movies (FREE NETFLIX) on the brand new 50” Samsung Smart Flat-screen HD TV and Blu-Ray player in the living room. Plus every bedroom also has new large flat-screen TVs and DVD players. Wireless internet, cable TV and free local and long distant phone service will also make your stay more enjoyable. Long Beach Resort boasts over 1,300 feet of white sandy beaches and beautiful emerald waters. Enjoy our 2 beach umbrella chairs reserved just for you....free! Cool off in the pristine waters of the Gulf of Mexico, or in one of the 3 pools on the property. The beautiful, huge Polynesian style Lagoon pool features two tropical islands, complete with waterfalls and palm trees as its centerpiece. The 2 smaller pools are seasonally heated. If you get hungry, try The Hangout Grill located right next to the Lagoon pool. Or if you like, the popular Pineapple Willy’s or Pompano’s restaurants are within walking distance. Also, Walmart is conveniently located across the street. Long Beach Resort is a gated property with 24 hour security. The property is located in the heart of Panama City Beach with easy and quick access to a multitude of other fine restaurants, golf and shopping. Come and enjoy our little piece of paradise.